When it comes to choosing a color palette, grey might not be a color scheme that first comes to mind. You may instantly think of colors that include brown or tans, blues or greens, or a combination of a few different colors. 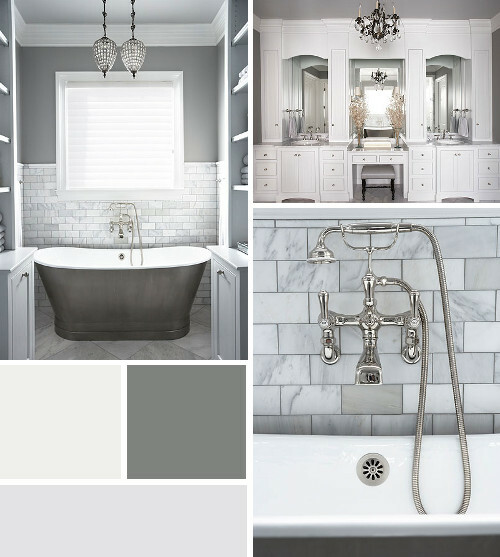 Even though it's not always top of mind, a grey color palette makes a beautiful statement in a home. There are many shades of grey - for example, whites with grey undertones or browns with grey undertones. But some of the most striking and bold greys are the smokey grey colors. Their deep and rich color pop against a neutral backdrop and can truly transform a space. Take this smokey grey bathroom. The smokey grey wall color mixed with the swirls of smokey grey in the subway tile contrast beautifully with the white trim detailing. The pedestal tub even incorporates this beautiful smokey grey color with its nickel slippered finish. This bathroom is the perfect oasis to retreat to after a long day and the smokey grey color scheme is striking yet serene, making it an ideal combination for this luxurious master bathroom. How do you feel about incorporating a smokey grey color scheme in your home? Like some of the accessories you see in this bathroom? Below is a list of some similar accessories that are now available in our online boutique. View additional photos from this Tuscan-inspired home.